Sandusky Lee has been a supplier of steel storage solutions for almost 70 years. Storage cabinets are one of their most popular product lines and are available in a range of cabinet options. For maximum storage, Sandusky Lee makes several tall storage cabinets that can hold anything from office supplies to classroom learning materials. Some tall storage cabinets feature wardrobe space for hanging clothes or work uniforms. For industrial applications, their new stainless steel cabinets resist rust and corrosion and are ideal for restaurants and cleanroom environments. If you need storage on the move, Sandusky Lee has mobile storage cabinets that are fitted with heavy-duty casters and push handles to make transport a breeze. For space saving storage solutions, browse their counter-height storage cabinets or wall-mounted storage cabinets. Many Sandusky Lee cabinets are available with radius edges for safety, or clear-view doors and expanded metal doors for quick identification. While all cabinets are locking, some are designed to support technology; such as their computer security cabinet that features a see-thru monitor window and ventilation vents to keep electronic equipment cool. Sandusky Lee also makes several office desks that are ideal for classroom or business space. Low prices help you save on desks such as the double pedestal desk, or the L shaped desks. For less secure storage, we have Sandusky Lee metal book trucks, steel shelving and metal bookcases that come in many powder coat finish colors. Flat files are a great solution for architectural firms, artist studio's, or anywhere large documents need storage. Individual storage can be achieved with metal lockers that allow separate storage space for several people all in one unit. 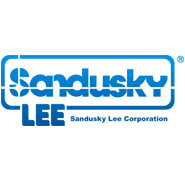 Sandusky Lee has several shipping locations across the U.S. so you can get great shipping rates wherever you are located.